All our UK orders are sent by Royal Mail and are fully insured. Most of our styles are made here in Derbyshire and despatched the same day we receive your order. 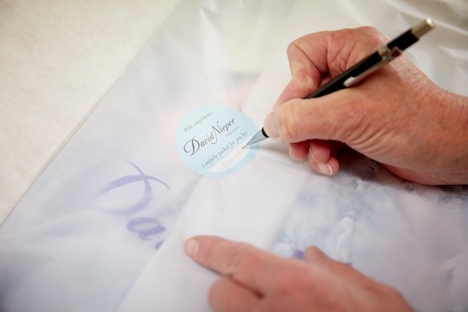 If your chosen items are not available to be sent to you immediately, our skilled team will get to work making them for you and we will contact you to let you know when they will be ready. If you have ordered more than one item, we may send them to you separately, at no extra cost to you. We hope you love your order, but if for any reason you want to return it, we offer a no-hassle refund or exchange, free of charge. Please return your items within 30 days in the same condition with the original packaging and the despatch note. A free Royal Mail postal label is included in every parcel, and we recommend you ask the Post Office for proof of posting, free of charge. When you take good care of your David Nieper clothes, they should reward you with years of comfort and elegance. If ever the quality of an item isn’t quite what you’d expect from us, please let us know by email or phone, as we may refund or replace it for you. It’s all part of our Quality Guarantee.